We left Seattle at 8am Saturday morning for the drive to Leavenworth. 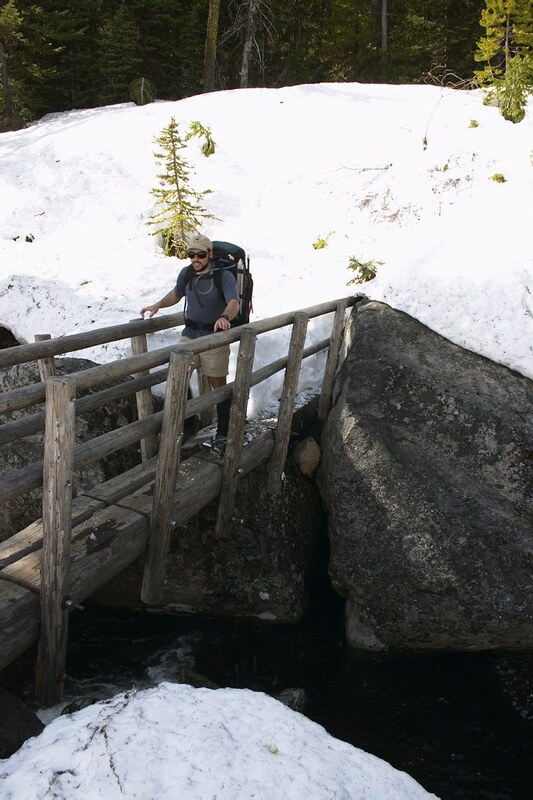 We had to stop about 1.5 miles short of the Mount Stuart trail head due to snow cover. Started hiking at 11.45am. The weather was great, sunny and warm. 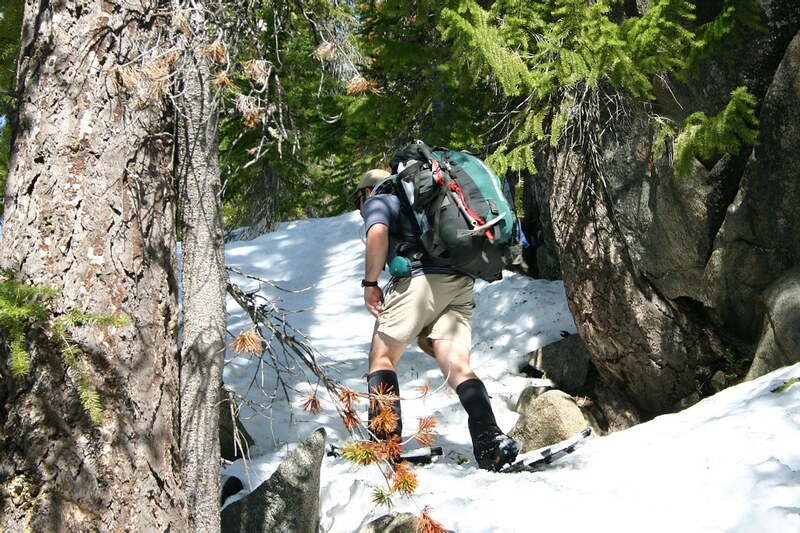 Since the trail was mostly covered with snow I used snowshoes right from the beginning. Jim made it without for a while; he put his on later. We met about 3 parties coming out. 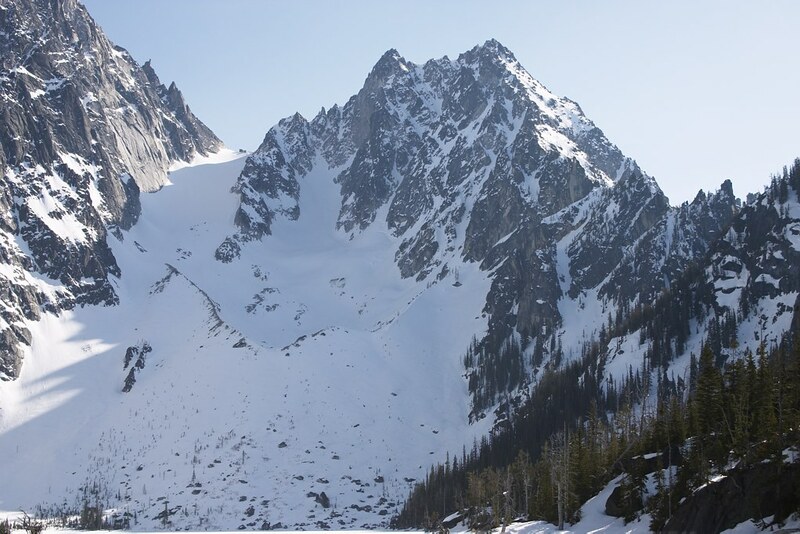 Some had climbed Colchuck, others had hiked in earlier that day and found the snow too slushy for a ascend that late in the day. There was also some talk about an avalanche the night before down Asgard Pass. 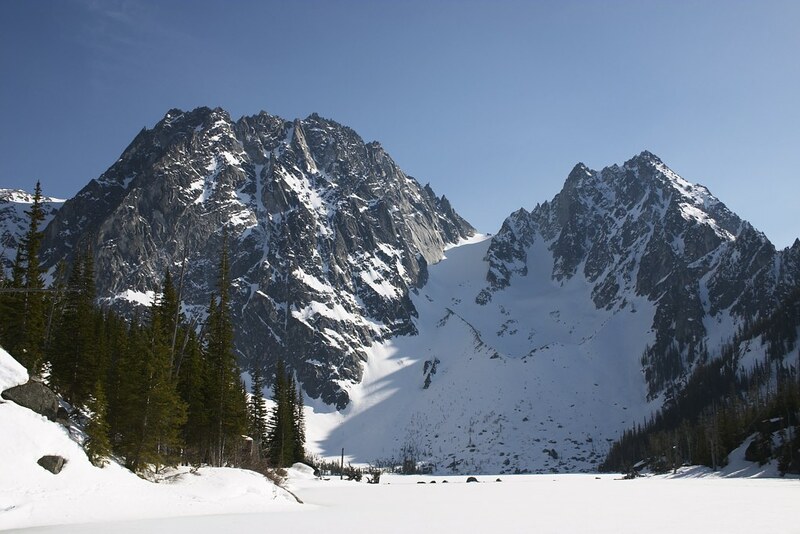 Everybody assured us that the frozen Colchuck Lake can be crossed - no problem. The last third of the trail, just before Colchuck Lake where it steepens, was a bit more difficult to follow and we got lost for a minute but found the trail again quickly. 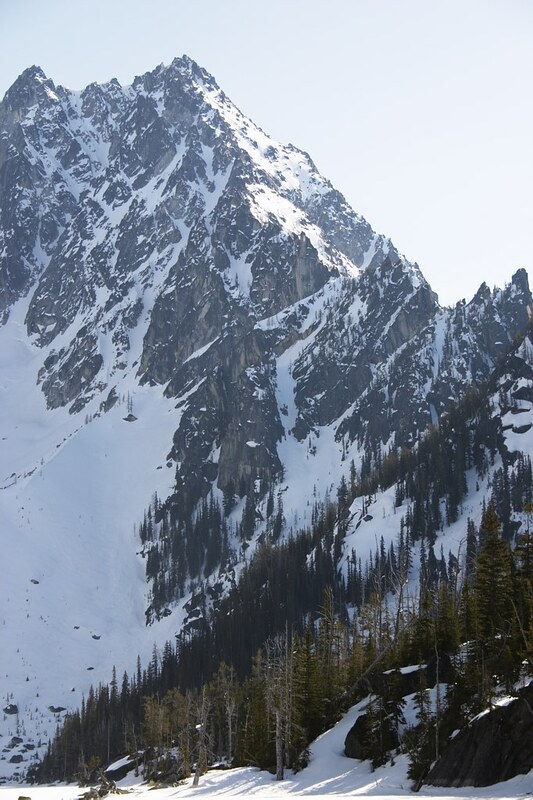 We reached the lake at around 4pm and were impressed by the sight of Dragontail and Colchuck. 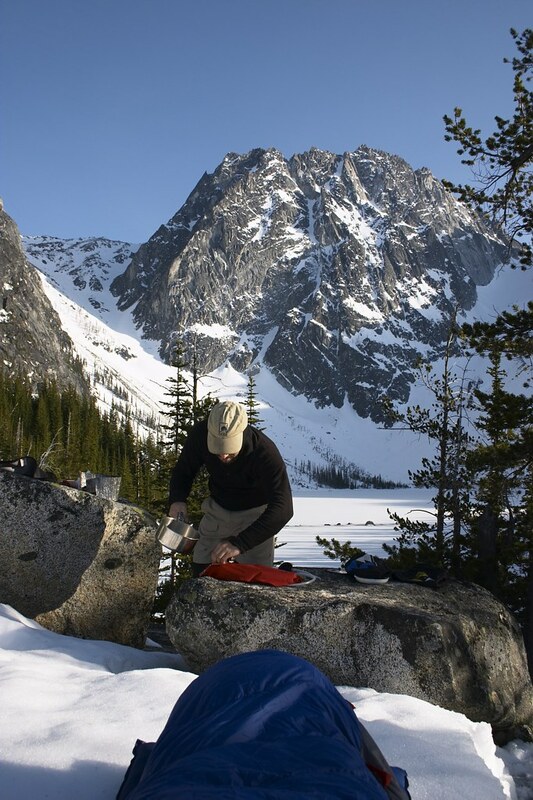 Since it was still pretty early, we decided to make camp at the south side of the lake to have a short approach to the base of the couloir in the morning. To get to the other side of the lake we had two options: Crossing it or walking around it. Since the sun had been beating on the lake for a few hours by then, the surface of the ice was melting and big puddles had formed. Because of this and since nobody else was in the vicinity we thought that it would be a major inconvenience if somebody broke through the ice in the middle of the lake. So we decided to walk at the east side around the lake. There was a boot path, so other people had done the same. At the beginning, the path was well on the shore but at some point big boulders where blocking the way and it went down onto the ice. Somehow we followed the paths onto the ice, which, in retrospect, wasn't a reasonable thing to do. As the two of us (both, by the way, theoretical physicists) where just discussing that the ice would probably be the thinnest near the shore and thicker in the middle of a lake, and therefore maybe this wasn't such a good idea, just in this very moment it happened: I confirmed our theory about the ice thickness by taking the term "breaking trail" too literally and crashing right through the ice with a big splash. Luckily, this happened close to the shore and, since the water was wet and cold, I was out of there in no time. Nevertheless, I had been up to my waist in the lake and was dripping wet. 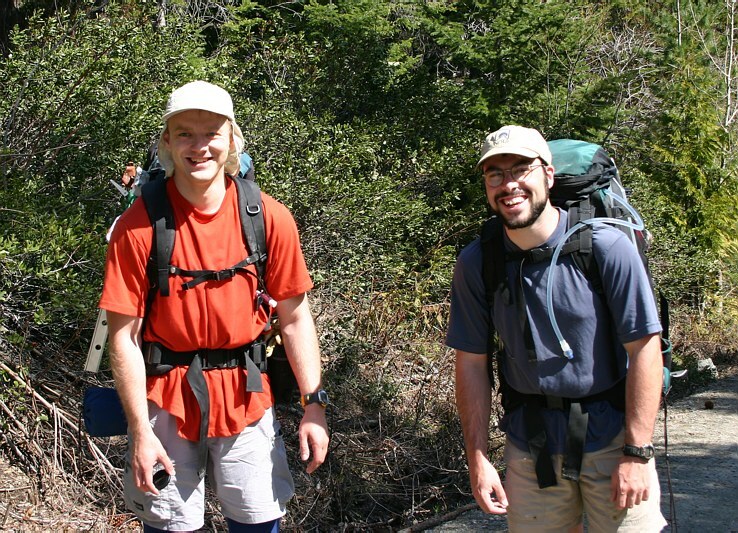 So we retreated carefully and made camp at the north shore on a few large boulders. While I tried to dry my clothes and rewarmed in my sleeping bag, Jim managed the kitchen with skill. We figured that with my wet boots the climb wouldn't happen and instead of staying overnight we decided to hike out the same evening. We were on our way at around 7.15pm, the sun set half an hour later, and we hiked out the rest of the way back to the car with our headlamps. It was a beautiful night, clear skies, perfect weather for a climb... Arrived at the trail head 10.30pm, got a snack in the only gas station in Leavenworth that was open that late and where back in Seattle at around 2am Sunday morning. Although we didn't reach our objective, fun was had by all anyway. Lesson learned: Don't walk on thin ice. 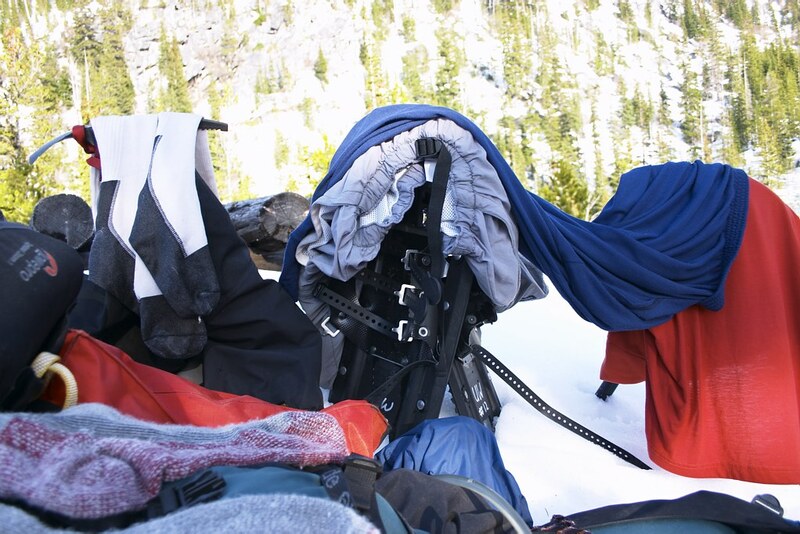 Gear I didn't bring but probably should have: 2nd set of dry clothes, a hair dryer for wet boots.